Notts County centre-back Haydn Hollis has a novel ideal about how to deal with the huge physical threat of AFC Wimbledon striker Adebayo Akinfenwa when the sides meet on Saturday. 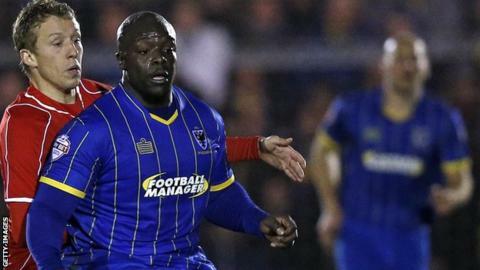 The 16-stone centre-forward, known as 'The Beast', can bench press 28 stone. But Hollis told BBC Radio Nottingham: "I'll bench press him! You've not seen me in the gym. But I'm joking. "He is is big and strong, but will he want to run us? We will probably keep a bit higher and keep him working." Notts lie 18th in the League Two table, having won just two of their first six league games. But they have a game in hand on every side except Crawley Town and won their last match 3-2 against Luton Town.